It soon became a lesson in resilience and tenacity! The mixing of the colors as shown below was the ONLY thing that DID go right the 1st time! Just follow the recipe on the color chart to achieve the color you want. I was going for a subtle tangerine/soft orange sherbert. Using the Makin’s® Ultimate Clay Machine™ roll out the new color keeping in mind you have to cover a bracelet note the size placed into the machine. I rolled it out at a #2 setting. Then trim the clay with the plain cutter wheel from the professional tool kit. Note in photo I made a template that I know would cover the length and width of the bracelet. Lay you CLEAN stencil over your clay and burnish it so it stays in place while applying the colors. OOPS NUMBER 1 - my stencil left a mark on the clay. Add the pan pastels starting with the lightest colors 1st. Now I messed up the OTHER SIDE!!!! SOO I started all over again. I thought HEY maybe I should use a different stencil and make the stencil slightly damp so it stays down on the clay. Uuummmm DON’T DO THAT, I will spare you now! The clay stuck to the stencil. UGH it was too damp. But I did let the clay dry completely and slowly peeled it off and it looks pretty good. I see earrings in the near future. Back to side 1; yeah the one with the stencil residue…………. I free handed the Pan pastels over the ghost image of the “residue” I think it came out pretty! Well I FINALLY got my romantic sunset image I was striving for. NOW to assemble this bad boy! 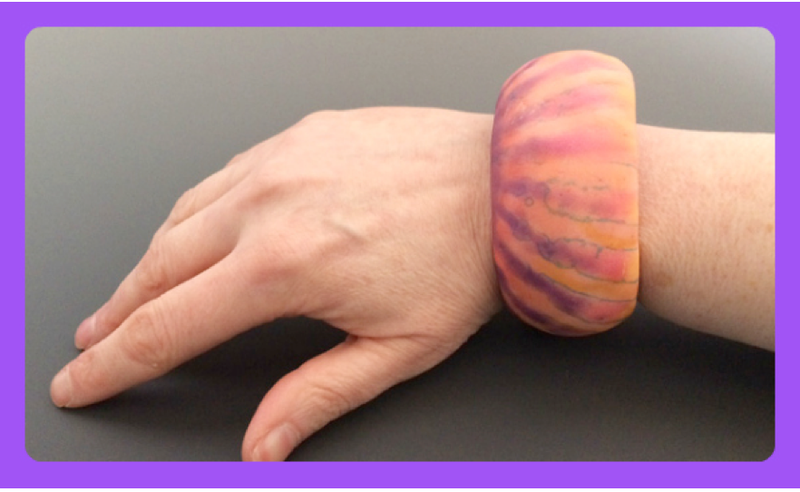 I let the clay dry for about 1-2 hours before adhering it to the wooden bracelet just so it was still pliable and stretchy. Cover the bracelet blank with a thin coat of Beacon’s Tacky glue. Then position the clay on the bracelet. To make sure the clay stayed put while it dried completely I put a weighted box on it while it dried. When it was almost dry completely I trimmed off the access clay. Come check out more of my creations as well as my errors! I goof up to hopefully save you from doing it! Pretty pastel colors...nice job Carole! So glad you redid the redo - love the coloring on this!